Using Amy's themes from her preK schedule we easily combined & completed Sonlight Cores B & K , while pulling in Five In a Row & other picture books, and enjoyed adding in hands on projects including many ideas from here. Click the numbers 1 or 2 for two quick pictorial views of some of our work. (sorry about the eye rush at the end of each slide). 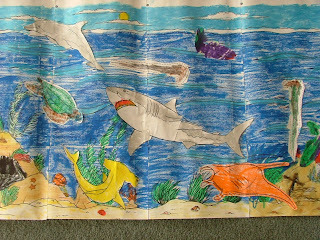 The OCEANS mural below is my favourite piece as the DC were so young & worked so passionately & diligently on it.